Store your favorite quotes, photos and memories in this nifty card folder that you can easily make yourself with our step-by-step plan. 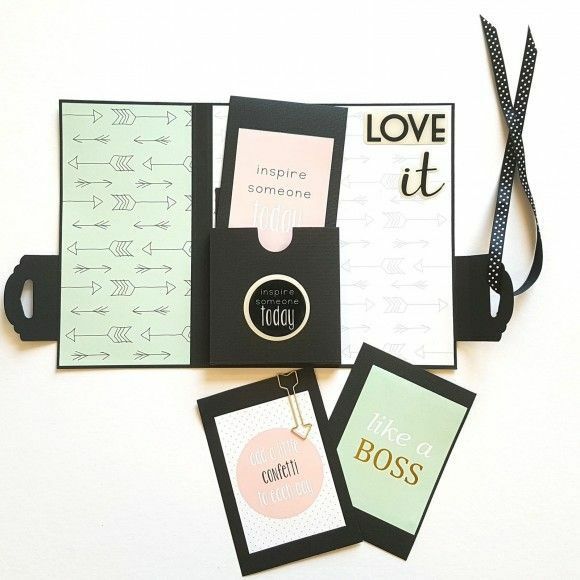 Express yourself with stickers, tags and the gorgeous scrapbook paper from the Love-it! collection. Keep the memories for yourself or give the folder as a present to someone close to you. Info: The articles we needed for this project can be found in our category "News"
For the basic card, cut a strip of black cardstock to 29.5 x 20 cm and score it at 10 and 11 cm. For the label-shaped fastening, cut a strip of black cardstock to 6.4 x 6 cm and score it at 1 cm. Then cut another piece of black cardstock to 6.4 x 7 cm and score it at 1 and 2 cm. At the end without score lines, punch the euroslot in your tags and fold them along the score lines. Stick the tags to your basic card, 2 cm from the bottom. Please note! Stick the tag with the single score line on the left-hand side of your card, on the outside of the folder’s cover. Stick the tag with the double score line on the right-hand side of your card, on the inside of the folder. Cut 2 sheets of scrapbook paper of your choice to 9.5 x 19.5 cm; stick one sheet on the cover and one sheet on the left of your open card. Next, cut scrapbook paper to 18 x 19.5 cm and stick it inside the folder, on the right. The pocket inside the folder is made from black cardstock that you cut to 13.5 x 12 cm. Score 3 sides of this sheet of cardstock at 1 and 2 cm. Then cut out the two little outer blocks and snip along the score lines to the long line. Fold the corners over to made a little pocket. Stick the pocket with double-sided tape to the inside of your card base. You can then decorate your folder with all sorts of stickers. Cut black cardstock to 9 x 13 cm and stick various texts from the Love-it! scrapbook paper to the cards. Finally, slip the little cards into the pocket and close the folder with a pretty ribbon threaded through the euroslot.